Sandy Tritt pictured in the center with guild members and guests, in front from left to right, is Mona Pickens, Wilma Acree, Carol Newberry, Sue Underwood, Ilse Burris, and in back from left to right is April Pyles, Patrecia Gray, Daniel Newberry, and Feryle Lawrence. The guild members and guests listening to Sandy Tritt as she discusses steps of publishing. 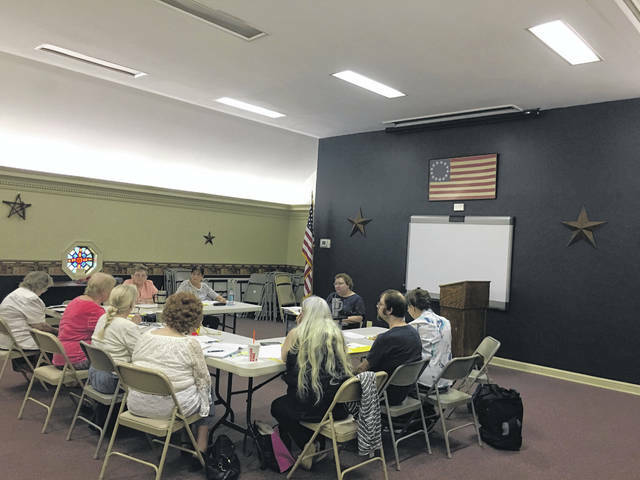 POINT PLEASANT — The Point Pleasant Writer’s Guild members welcomed a special guest to speak at their recent meeting. Sandy Tritt, founder and CEO of Inspiration for Writers, Inc., is known for her works “Everything I Know” and “The Plain English Writer’s Workbook.” Tritt discussed the publishing process step by step with guild members and guests. When it comes to publishing, many options are available to authors, commented Tritt. She explained an author can choose to take the traditional publishing route where the publishers pay advances to purchase the rights to the author’s work and pay royalties for the sales. Tritt said if an author searches out larger publishers, the safest bet for an author is to go into a contract with a literary agent. The literary agents will help the authors work get to the publishers. Tritt suggested attending writing conferences where literary agents are present and speaking to an agent one on one. However, if an author chooses to seek out a smaller publisher, unagented material can be accepted. Tritt explained some authors may choose to seek nontraditional ways of publishing such as taking a self publishing route, doing print on demand, or by combining traditional with nontraditional publishing — hybrid publishing. Hybrid publishing is where a book can be accepted as either traditional, self-published, or co-published. Tritt advised aspiring authors to not go the hybrid publishing route. If an author chooses a traditional publishing route, then a query letter must be written. Tritt explained a query letter should fit on one page and have three paragraphs. The first paragraph telling about the book, the second paragraph telling about the author, and the third paragraph summarizing what the author is wanting from the publisher. Tritt said an author will also need to either write a synopsis for a work of fiction or a book proposal for a work of non-fiction. She discussed the proper and most effective way to set up these pieces. Tritt discussed when an author should copyright their work and how to do so, as well as walked the guild members and guests through self-editing guidelines. “Mistakes are forever” is a warning Tritt gave at the meeting and discussed editing tips. She advised when authors are proofing their work, they should write down their characters and settings and when re-reading their work, make sure all stay consistent. Tritt said when reviewing different scenes of their story, the question “Is this scene necessary?” should be answered. If the scene is not necessary, cut it out. She also warned about avoiding repetition in paragraphs and to be mindful of how many adverbs and adjectives are used. Tritt advised authors to also highlight the five senses used within their stories and to be sure all senses are utilized and one is not used too much. She opened the floor for questions and one main concern was how do authors keep their motivation. Tritt said if an author feels they need to tell a story, time will be made, and the author must ask themselves what is most important. 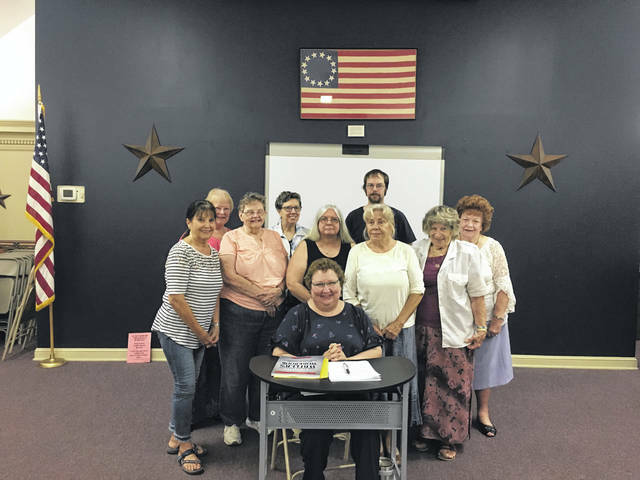 https://www.mydailysentinel.com/wp-content/uploads/sites/14/2018/09/web1_0907-1-.jpgSandy Tritt pictured in the center with guild members and guests, in front from left to right, is Mona Pickens, Wilma Acree, Carol Newberry, Sue Underwood, Ilse Burris, and in back from left to right is April Pyles, Patrecia Gray, Daniel Newberry, and Feryle Lawrence. https://www.mydailysentinel.com/wp-content/uploads/sites/14/2018/09/web1_0907-2-.jpgThe guild members and guests listening to Sandy Tritt as she discusses steps of publishing.